This day in 1974, newspapers proudly published the Skylab astronauts safely descending back to earth. In the city of Toronto, the music store turf war between Sam the Record Man and A&A Records was still a fixture on Yonge Street. February 8th of 1974 was also an important time in establishing an annual mid-winter tradition for varying degrees of automotive enthusiasts. Opening for what would evolve into Canada’s largest exhibition of cars and trucks, the first Toronto Auto Show hosted vehicles from North America, Japan and Europe. During the 10-day event that year, the display would eventually become a serious national happening recognized as the Canadian International AutoShow. First staged as the International Centre near the Woodbine Race Track and Toronto’s Pearson International Airport, the 1974 Toronto Auto Show was an exhibition that reignited the spectacle of seeing many of the newest cars in one spot. As the trend of automobiles caught on through the 1920s, Toronto’s first public collection of new vehicle technology was part of the CNE (Canadian National Exhibition). In 1929, the Automotive Building housed 51 cars. The CNE auto show remained a draw until the Second World War altered the event into a military display. Despite the end of fighting in 1945, the vast annual display of automobiles did not return. The show would return in the 1950s and last until the 1967 CNE show. In later years, the Toronto CNE Grounds hosted the arrival of many non-North American brands including Volkswagen and Isuzu. Seven years later, an International caliber auto show would return to the city with the Toronto Automobile Dealers Association sponsorship. With more than 300 new vehicles and other displays, the 1974 edition of the auto show at the International Centre contained a car-racing movie screenings as well as a figure skating show. 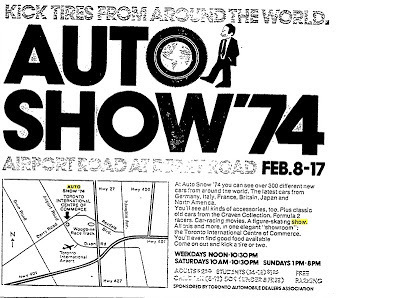 Admission to the first-ever Toronto Auto Show was $2.50 for an adult. Growing in prominence, the Toronto Auto Show relocated in 1986 to the than-newly constructed Metro Toronto Convention Centre. By the mid-1980s, the auto show was able to swell to 500 new vehicles including a Lamborghini Countach, Audi 5000 quattro and a very rare TVR 390SE sports car. In the 1990s and 2000s, the show would also occupy the Skydome (now the Rogers Centre) with manufacturer displays. In the Metro Toronto Convention Centre, the Canadian International AutoShow has continued to thrive as an annual exhibition. As well as featuring the newest vehicle models from leading car companies, the Canadian International AutoShow also lures the best of car culture into a hospitable climate. Special displays in recent years have brought classic collections of Chevrolet Corvette, Shelby, Chevy Camaro and Triumph brand vehicles into the show. 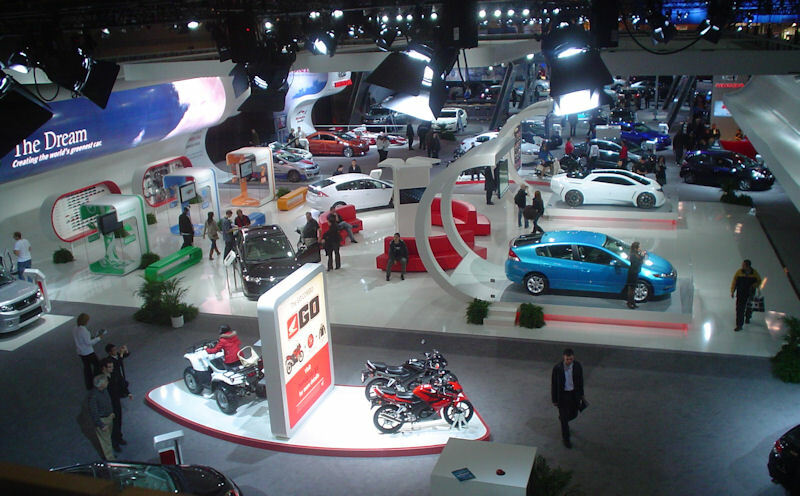 While the crippling effects on the 2009 automotive industry did cause some consolidation as manufacturer displays shrank (the Rogers Centre would be excluded from the Canadian International AutoShow’s floor plan in 2010), following editions of the show drew back car company enthusiasm and spectators. Posting an attendance of 253,384 people in 2009, the 2012 Canadian International AutoShow ballooned to a record of over 316,000 spectators. For the 40th annual display since the 1970s revival, the 2013 Canadian International AutoShow will open to the public on February 15th unveiling over 125 distant displays. This year’s auto show in Toronto will compose of $30,000,000 worth of new cars with the Auto Exotica display (consisting of many six-figure super vehicles) pressing the collection’s value up substantially higher. The 2014 Chevrolet Corvette Stingray, SRT Viper, Ford Fiesta ST and the BMW M6 Gran Coupe will be part of more than 1,000 vehicles inside the 500,000 square-foot Metro Toronto Convention Centre event. Cruise National, Auto Exotica and Eco Run Exhibit featuring fuel-efficient transportation solutions will be returning in 2013. Special displays in 2013 consist of Canadian Hot Rod Builders Showcase and the Sport Compact Evolution sections.